Want to stay informed? Visit the MEIC Blog for regular updates. The Mobile Experience Innovation Centre is a not-for-profit association that supports design leadership, experience innovation and applied research in Canada’s mobile and wireless industries. Since its founding in 2007 by OCAD University, The Mobile Experience Innovation Centre (MEIC) has grown from a mobile sector strategy and lobbying initiative to Canada’s only organization focusing on design leadership, sector growth and integration, and innovation in mobile content, services and computing. MEIC offers a membership program to serve clients and partners alike. Its Board of Directors includes international businesses such as Microsoft and IBM, Canadian strategic companies such as RBC Royal Bank and GestureTek, public sector entities, SMEs, associations, universities, and colleges. Its wider membership includes all major mobile associations and a wide array of mobile industry partners. MEIC focuses on supporting start-ups and early-stage entrepreneurs, research commercialization, and national and international advocacy on behalf of Canadian companies, creating a strong framework in a fragmented industry. MEIC offers programs that work with SMEs, researchers and NGOs in Canada and abroad for the purposes of partnership, collaboration, research and business development. All programs are designed to encourage research commercialization and business growth to Canadian SMEs, corporations and academic institutions. MEIC also hosts conferences, workshops and partners with other organizations to deliver quality and relevant events.For more information about our work, please see About. Past research success include the first iteration of the Applied Research and Prototyping Program which resulted in 22 projects with Ontario-based SMEs and academic institutions over 18 months, the development and delivery of Innovation and Insight: Mapping Ontario’s Mobile Industry. 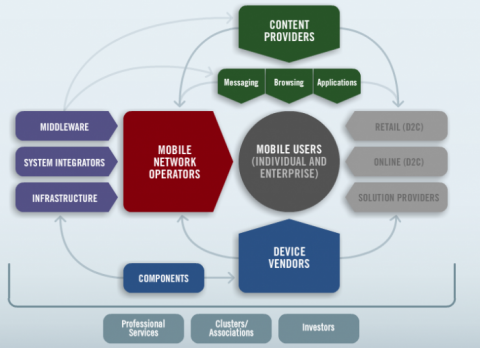 This interactive map explores the Canadian mobile media ecosystem. The model represents the different types of companies in the value chain ecosystem and the arrows show the direction of added value. Please click on the map below to further explore the model and to see examples of Canadian companies working in the space.